A major well known museum in York instructed Chill Tech Solutions to replace their two main chillers and associated M&E works. 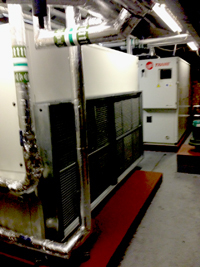 The original chiller units had been installed many years ago in an adjacent building and accessing new equipment was extremely restricted. Chill Tech Solutions carried out a detailed site survey to provided the client a complete refurbishment design based on life cycle cost analysis of various manufacturers solutions. We were also tasked increase the overall duty of the chiller installation, whilst maximising all available space in a compact plant room. The replacement Chillers were dismantlement and ” flat packed” for delivery to site. 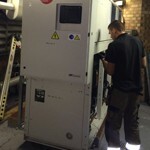 The old redundant equipment was dismantled and removed from site and the new Chiller sections built ”in situ”. All services were then replaced and commissioned.